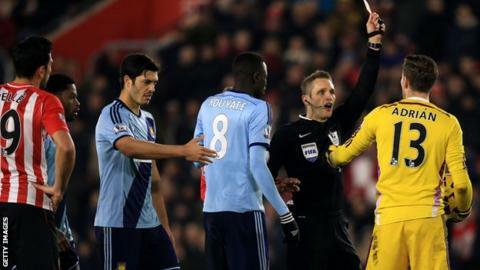 West Ham had goalkeeper Adrian sent off but frustrated Southampton by holding on for a goalless draw at St Mary's. The keeper was red carded when he handled outside his box under pressure from Sadio Mane after a clumsy touch. Mane was denied by a goal-line clearance earlier and Saints pushed for a winner but Maya Yoshida headed over as the Hammers defended bravely. West Ham's point came despite an injury to substitute Andy Carroll who was hobbling badly in the closing stages. The Hammers' first clean sheet in 18 away games means Southampton dropped to fourth, a point ahead of Arsenal. Few Saints' fans could have dreamed their side would be pushing for a top-four finish when players such as Adam Lallana, Luke Shaw and Dejan Lovren left in the summer but this latest result will feel like a missed opportunity. Ronald Koeman's side failed to create clear-cut chances before Adrian was dismissed but they dominated the remaining 30 minutes without adding the end product to their approach work. Striker Graziano Pelle, now without a goal in eight league games, glanced a header wide in added time and in a frantic finish Dusan Tadic was denied by a Jussi Jaaskelainen save. West Ham played the closing stages with Carroll limping, effectively reducing them to nine capable players but their determined display leaves them eighth, eight points behind their hosts. Their manager Sam Allardyce this week told reporters "no coach was more sophisticated" than him in the Premier League and he had to make late adjustments to his side, admitting before kick off his staff "haven't had any real practice with those available" since Sunday's draw with Manchester United. Despite being without the injured Kevin Nolan and unwell Mark Noble in midfield, they were still organised throughout. Aside from Mane's run and shot which prompted a Carl Jenkinson clearance in the first half, Adrian was relatively untroubled until the hour mark, where the first sending off of his career arrived. It was a clear dismissal as his decision to try to wrong-foot Mane backfired, prompting panic which ended with the Spaniard falling on the ball and striking it with his hand. The home side sensed a seventh win in nine league games and introduced January signing Filip Djuricic for his debut but neither he nor fellow substitute Tadic could break the resistance. Southampton attacked in waves and Aaron Cresswell's brave block prevented Nathaniel Clyne's powerful volley, before Yoshida headed over when well placed. Koeman's side have now failed to win at home in five of their last seven league games but have only dropped out of the top four for two weeks since September. Southampton manager Ronald Koeman: "If you play 30 minutes 11 against 10 then you have to score the goal but we didn't. Everybody was running and we didn't make the pitch wide to make the space. Too many crosses and I think that is the easy way for them to defend. "I said at half-time if we kept the organisation the front players have to win the game tonight but they didn't. You have to react and work harder and be sharp in the box." West Ham manager Sam Allardyce on Adrian's sending off: "It's a foul on the goalie. Two hands around him, two around his back. It's bizarre why they can't see it but this is what we have to stomach today and it nearly cost us dearly. It lost us the opportunity to win the game and we had to battle with nine in the end when Carroll got injured to get an unbelievable point." BBC Match of the Day's Phil Neville: "I'm with big Sam on this one. Adrian is fouled by Mane. He has got two arms around him and Adrian panics." MOTD's Martin Keown: "It was a sending off. It's not a conspiracy against West Ham. There may be a hint of the foul there but the goalkeeper is taking a liberty. His first touch is poor and then he gets robbed by Mane. What big Sam will tell him in the next game is just to clear it." Match ends, Southampton 0, West Ham United 0. Second Half ends, Southampton 0, West Ham United 0. Attempt saved. Dusan Tadic (Southampton) right footed shot from the centre of the box is saved in the centre of the goal. Assisted by Jose Fonte. Corner, Southampton. Conceded by Cheikhou Kouyaté. Corner, Southampton. Conceded by Jussi Jääskeläinen. Attempt saved. Jose Fonte (Southampton) left footed shot from outside the box is saved in the bottom left corner. Assisted by Victor Wanyama. Attempt saved. Graziano Pellè (Southampton) header from the centre of the box is saved in the bottom right corner. Assisted by Dusan Tadic with a cross. Attempt missed. Maya Yoshida (Southampton) header from very close range is high and wide to the left. Assisted by James Ward-Prowse with a cross following a corner. Attempt blocked. Maya Yoshida (Southampton) right footed shot from outside the box is blocked. Assisted by Florin Gardos. Attempt blocked. Filip Djuricic (Southampton) right footed shot from outside the box is blocked. Assisted by Steven Davis. Substitution, Southampton. Filip Djuricic replaces Sadio Mané. Delay in match Andy Carroll (West Ham United) because of an injury. Attempt saved. Graziano Pellè (Southampton) right footed shot from the centre of the box is saved in the top centre of the goal. Assisted by Dusan Tadic with a cross. Attempt blocked. Nathaniel Clyne (Southampton) right footed shot from the centre of the box is blocked. Assisted by James Ward-Prowse. Attempt blocked. Nathaniel Clyne (Southampton) right footed shot from outside the box is blocked. Assisted by Victor Wanyama. Offside, Southampton. Steven Davis tries a through ball, but Sadio Mané is caught offside. Attempt missed. Graziano Pellè (Southampton) left footed shot from the centre of the box is too high. Assisted by Sadio Mané. Corner, Southampton. Conceded by Carl Jenkinson. Substitution, Southampton. James Ward-Prowse replaces Harrison Reed. Offside, Southampton. Maya Yoshida tries a through ball, but Sadio Mané is caught offside. Attempt blocked. Dusan Tadic (Southampton) left footed shot from outside the box is blocked. Substitution, West Ham United. Jussi Jääskeläinen replaces Carlton Cole. Substitution, Southampton. Dusan Tadic replaces Eljero Elia. Adrián (West Ham United) is shown the red card. Hand ball by Adrián (West Ham United).